The world of being found is changing quickly. For years now the phone books were a 'must' for businesses of all types, now we're all moving online at an astonishing rate. 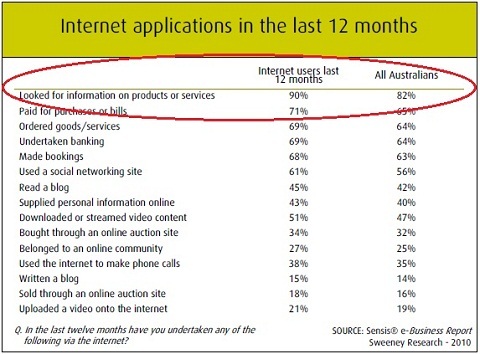 According to Nielsen, 80.1% of Australia’s population were online in 2010 (= 17.03 million people). A recent Sensis report claimed that 90% of Australian internet users used the internet to look for information on products or services. Taking into consideration Google’s 94% market share in Australia, we can deduce that 14.41 million Australians have used Google in 2010. That’s almost 68% of the entire Australian population. No other site has this kind of penetration! This represents a rapid growth over the last three years. In fact the latest trend points to a huge increase in using mobile phones for searching for businesses and services, an area Google very keen to expand quickly, and for good reason. A recently published statistics indicate that 41% of all mobile phone users in Australia access the web, with searching for products and services listed as the 4th most popular activity at 56% which represents a 15% increase over the previous year. Organise Internet has been in THE SEARCH BUSINESS for many years and our accumulated experience is reflected in our mature and practical approach to online developments. Our deep knowledge of other Google products and services really helps navigate this relatively new area of business marketing. So if you're looking at getting found by the people who want to find you, talk to us. We're not script kiddies or back room operators, we know a lot about search and we're happy to help you get the results you're looking for. Email David or Danis or call us on (02) 4340 5706 and book a low cost briefing session. We're bound to surprise you about the possibilities for those that adopt a flexible mature approach. It has been estimated that 30 billion pieces of content i.e. links, stories, blogs, pictures, etc. are shared on Facebook each and every month. Getting noticed is becoming ever more difficult as more marketers converge on this platform. When’s the best time to post? When are people engaging with our content? A recent study conducted by Buddy Media (a Facebook marketing software company) has answered many of these questions by analysing a sample size of 200 clients for a two week period earlier this year. Below is a summary of their findings that we thought many of you might be interested in. Keep your message short and sweet! Posts shorter than 80 characters have a 27% higher engagement rate. Asking your followers to click a shortened link (tinyURL, etc.) is a question of trust. By using a full-length URL, you are essentially tripling your engagement rate. If you must use URL shorteners, utilise brand-specific shorteners, e.g. http://org.int/234c. It’s estimated that 60% of posts are published during office hours. Brands that post outside of these times usually enjoy a 20% higher engagement rate. This emphasises the idea that most people check their feeds outside of office hours, hence it represents the best time of engagement (early morning or late at night). Buddy Media’s research indicates that engagement rates on Thursday and Friday are 18% higher than on other days of the week. The fundamental rule is to keep requests simple. Outright requests to “like”, “post”, “comment”, or “tell” you something will typically generate a response. If running a contest, sweepstakes, or promotion, the use of “softer sell” keywords such as “winner”, “win”, “event”, and “offer” will resonate better with your fans. Generating excitement rather than selling directly is more effective and increases your engagement rate. The aim of a question is to invoke a response. Placing your question at the end of a post yields a 15% higher engagement rate than posts where question placement is near the beginning or middle of the post. Many companies and businesses are now looking to Facebook to engage with their customers/clients. With the amount of posts generated each day, it’s very easy to be overlooked by your target audience. A well thought out marketing plan is only as good as its execution. We hope the above summary was helpful in maximising the returns of your efforts.